Air quality officials are continuing their advisory for air pollution in North Carolina on Wednesday as smoke from numerous wildfires continues to affect much of the state. Residents in the mountains, foothills and western Piedmont could experience unhealthy air quality, depending on wind directions. Governor Pat McCrory announced last week that the state is offering a reward of up to $10,000 to anyone who provides information leading to the arrest and conviction of the person or persons responsible for setting wildfires in western North Carolina. Many of the wildfires throughout the region are believed to have been man-made. About 17 wildfires covering more than 53,000 acres of land are burning in Western North Carolina and smoke from those fires can contain high levels of air pollution. Residents throughout the affected areas could be exposed to Code Red (unhealthy) or Code Orange (unhealthy for sensitive groups) levels of particle pollution. For Wednesday, forecasters have predicted Code Red conditions, or unhealthy, for much of the mountains region, including the Asheville area. Code Orange conditions, or unhealthy for sensitive groups, are forecasted for the northern and southwestern mountains, much of the foothills, and parts of the western Piedmont. See the air quality forecast map for more details. 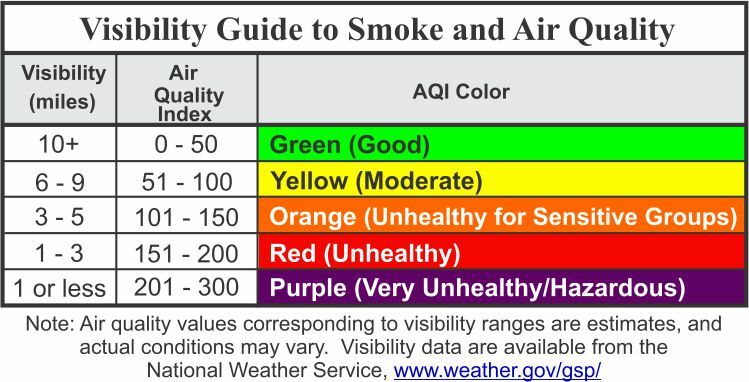 Local air quality conditions can vary widely due to winds, the spread of fires and other weather factors. Residents should limit their time outside if they observe low visibility and odors due to smoke, which indicate that the air is probably unhealthy to breathe. The forecast means everyone in Code Red areas should avoid or reduce prolonged or heavy exertion outdoors, and sensitive groups should avoid any activity outside. Sensitive groups include the elderly, children, people who work or exercise outdoors, and those with heart conditions and respiratory ailments such as asthma, bronchitis and emphysema. In Code Orange areas, sensitive groups should limit vigorous activity outdoors.